This web site is a personal project, not an official site, nor a commercial site, nor a charity. 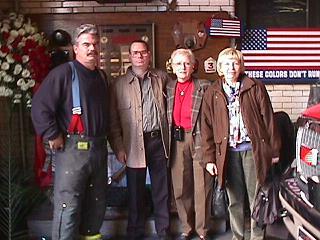 Thanks to a former client—I have learned of fireman John McAvoy at Ladder Company 3. Prior to the 11th of Sept. he was helping her research the life of her great grandfather, who died in the line of duty for Ladder Company 3 in 1903. She asked me to find John McAvoy after Tuesday Sept. 11th. I went to Ladder Company 3—a company of 25 firemen. John McAvoy and 11 other firemen are still missing and presumed dead. Half of Ladder Company 3 gave their lives on that Tuesday morning. There were candles and flowers and beautiful notes and posters adorning every surface within a block of the firehouse. In the firehouse, I saw a small poster describing the Ladder 3 Assistance Fund.